The lobby of the Library of Virginia shimmered with columns of light and beautifully decorated tables as the Library celebrated its 15th year of honoring Virginia writers and books about Virginia topics. Guests were treated to an elegant seated dinner. The 15th Annual Library of Virginia Literary Awards were sponsored by Dominion. The October 20 awards celebration was hosted by award-winning Virginia author Adriana Trigiani. Awards categories were fiction, nonfiction, poetry, and literary lifetime achievement. Winners of the Library of Virginia's Annual Literary Awards receive a cash prize and a handsome engraved crystal book. David Huddle is the recipient of the 2012 Emyl Jenkins Sexton Literary Award for Fiction for Nothing Can Make Me Do This, which the judges felt was written with compelling honesty, humor, and grace. Huddle's elegantly written 10th work of fiction depicts the quirky interior lives that families and close friends seldom reveal to one another. Originally from Ivanhoe, Virginia, Huddle holds degrees from the University of Virginia, Hollins College, and Columbia University. He taught for 38 years at the University of Vermont, and then served three years as Distinguished Visiting Professor of Creative Writing at Hollins University. In 2000 Huddle was a literary award finalist in both the poetry and fiction category. That year he won the Library's fiction prize for The Story of A Million Years, his debut novel. The other finalists for the fiction prize were: Welcome to Americastan by Jabeen Akhtar and The Art of Fielding by Chad Harbach. The judges praised Akhtar's lively debut novel for portraying timeless elements of love, friendship, and traditional values contending with confusion, resentment, and suspicion in the complexities of 21st-century America. The Art of Fielding, set during the baseball season at a private college, sings with the promising voice of youth to readers who don't know or care about the difference between a ball and a strike. The judges also selected an honorable mention in the fiction category: Mercy Creek by Matt Matthews. The winner of the 2012 Literary Award for Nonfiction is Maurie D. McInnis for Slaves Waiting for Sale: Abolitionist Art and the American Slave Trade. The judges felt that Slaves Waiting for Sale wasabeautiful book about an ugly subject, combining art history and social history—aesthetic discernment and pioneering archival and archaeological research—to present remarkable new insights about slavery and the slave trade in Richmond, Savannah, Charleston, and New Orleans. Bolstered with historic illustrations, Slaves Waiting for Sale offers fresh and startling perspectives about the antebellum South. McInnis is an associate professor and associate dean for undergraduate academic programs at the University of Virginia. Her main research interest is in the cultural history of American art in the colonial and antebellum South. Her book The Politics of Taste in Antebellum Charleston won the South Carolina Historical Society's George C. Rogers Jr. Award and the Society of Architectural Historians' Spiro Kostof Book Award. The other nonfiction finalists were: Midnight Rising: John Brown and the Raid that Sparked the Civil War by Tony Horwitz and Brown's Battleground: Students, Segregationists, and the Struggle for Justice in Prince Edward County, Virginia byJill Ogline Titus. Part biography, part historical narrative, Midnight Rising demonstrates why John Brown was—and remains—so troubling and important for modern Americans. Thoroughly researched, intellectually rigorous, and clearly written, Brown's Battleground speaks powerfully to questions that still confront American communities today. Brown's Battleground focuses on the people whose lives were affected not only by Brown v. Board of Education but also by the prevailing attitudes of the time. David Wojahn, director of the creative writing program in the Department of English at Virginia Commonwealth University, won the 2012 Literary Award for Poetry for World Tree. World Tree is a remarkable whole, at once richly allusive and completely familiar.The judges praised Wojahnasthe master of parallel narratives, who treats time as its own geography, braiding the personal with the historical in poems consistently brilliant and beautiful. World Tree becomes an invocation not to linger with but to recognize the dead so as to dwell finally with the living. Ever since his first collection, Icehouse Lights, was chosen for the Yale Series of Younger Poets Award in 1981, Wojahn has been one of American poetry's most thoughtful examiners of culture and memory. In addition to his books of poetry, Wojahn is the author of a collection of essays on contemporary poetry. He has received fellowships from the Guggenheim Foundation, the National Endowment for the Arts, the Fine Arts Work Center in Provincetown, Massachusetts, the Illinois Arts Council, and the Indiana Arts Commission. In 2009 Wojahn received the Carole Weinstein Poetry Prize, a $10,000 annual award that recognizes poets with strong ties to central Virginia who have contributed significantly to the art of poetry. The other poetry prize finalists were Touch by Henri Cole and Hawks on Wires by Dave Smith. Situated in the “fraught territories of self and family,” the poems in Touch fuse beauty and terror, Cole's formal intensity a vital part of their meaning. The narratives in Dave Smith's Hawks on Wires range from interactions with the natural world and the landscape of tidewater Virginia to a night at Waffle House. Making “the work of the imagined” palpable, Smith's poems—ever vivid, gorgeously musical—reflect the richness and tensions of the American South. The judges also selected an honorable mention in poetry category: Nine Acres by Nathaniel Perry. The winners of the People's Choice Awards are The Sixth Man by David Baldacci in the fiction category and Lost Communities of Virginia by Terri Fisher and Kirsten Sparenborgin the nonfiction category. Winners are decided by readers voting online and in libraries. Winners of the People's Choice awards receive a cash prize and an engraved crystal book. Also honored at this year's Literary Awards was When a Dragon Moves Inby Jodi Moore, which was selected as the winner of the annual Whitney and Scott Cardozo Award for Children's Literature. A juried panel selected five finalists from nominated authors whose works focused on literature for children ages four through eight, with a publication date of 2011. Nominated titles were accepted from the greater mid-Atlantic region. A public vote occurred online and in public libraries throughout central Virginia in July and August. Kelly Cherry won this year's Carole Weinstein Prize in Poetry. Cherry is a graduate of Mary Washington College, was a Du Pont Fellow at the University of Virginia, and earned her graduate degree from the University of North Carolina at Greensboro. She is the author of 20 books of fiction, poetry, memoir, essay, and criticism. She was the first recipient of the Hanes Poetry Prize given by the Fellowship of Southern Writers for a body of work. She served as Poet Laureate of Virginia from 2011 to 2012. The Weinstein Prize recognizes significant recent contributions to the art of poetry and is awarded on the basis of a range of achievement in the field of poetry. There is no formal application process or competition. Selection and notification of the annual prize is made by a three-member board of curators. The recipient of the 2012 Library of Virginia Literary Lifetime Achievement Award is Tom Robbins, best-known for his 1976 novel, Even Cowgirls Get the Blues. Robbins was named by Writer's Digest as one of the "Top 100 Writers of the 20th Century" and has been recognized with numerous awards, including the Golden Umbrella from the Seattle Bumbershoot Arts Festival for lifetime achievement in arts and Willamette Writers' Distinguished Northwest Writer Award. Next year's Literary Awards Celebration will be held on October 19, 2013. Librarian of Virginia Sandra G. Treadway is leading a day trip to Washington, D.C., to explore the private research collections of the Dibner Library of History of Science and Technology (American History Museum) and the Cullman Library (Natural History Museum) at the Smithsonian Institute. Guests will get an exclusive look at two distinct collections, learn about conservation and preservation methods, and enjoy holiday shopping in the Smithsonian museum shops. A wine-and-cheese reception will be served on the trip home. Fans of the popular PBS program Downton Abbey will be pleased to know that Lord and Lady Carnarvon, who currently preside over Highclere Castle, the country estate on which the popular series Downton Abbey is filmed, recently visited the Library of Virginia to do genealogical research. The countess discovered that her husband's family had American roots, through his grandfather's wife, and while she was in the United States on a speaking tour, she did some research for her next book. Although many of the family got to England via Maryland and New York, they do have important Virginia ancestors in the Lee and Fendall families. The person probably best known and documented is Philip Richard Fendall (1734–1805), office holder, lawyer, merchant, and builder of the Lee-Fendall House in Alexandria, Virginia. Fendall married in succession three Lee women, one of whom owned Stratford Hall for a time. He was the stepfather-in-law of Lighthorse Harry Lee and a close friend of George Washington. His son Philip Richard Fendall II (1794-1867) was district attorney of Washington, D.C., and a first cousin of Robert E. Lee. He oversaw the reconstruction of the new U.S. Capitol after its destruction during the War of 1812. Lord and Lady Carnarvon and their son spent time in the Library's Special Collections Reading Room viewing materials related to the family's history. Librarian of Virginia Sandra Treadway, former State Archivist Conley Edwards, Special Collections Director Tom Camden, and Archives and Library Reference Services Manager Ginny Dunn showed legislative petitions, broadsides, family books, a George Washington letter to Philip Richard Fendall, a letter to Governor Henry Lee requesting a pardon for a slave, insurance policies, broadsides, and a land grant for 63,600 acres in Wythe County related to the Lee-Fendall family. Lady Carnarvon, the eighth and current countess of Highclere Castle, taped a promotional spot for the upcoming third season of Downton Abbey for WCVE-TV 23 while she was at the Library. The show premieres on January 6, 2013. Virginia's public library directors have awarded Lynn Dodge, director of the Lynchburg Public Library, the 2012 Elizabeth M. “Libby” Lewis Award, named for the former director of public library development at the Library of Virginia. Also nominated for the award were Peggy Bias, director of the Bedford Regional Library; Sam Clay, director of the Fairfax County Public Library; and Wayne Crocker, director of the Petersburg Public Library. The annual award is given to the Virginia library director who most embodies the qualities of enthusiasm, nurturing spirit, and love of libraries. The award was presented at the recent annual meeting of the Virginia Library Association in Williamsburg. Dodge was recognized for her steady and effective leadership, her willingness to assist and collaborate with her colleagues, and her vision for responsive, user-centered policies. She began her library career as a branch manager for the Henrico County Public Library. In 1974 she was appointed director of the Lynchburg Public Library. Her quiet enthusiasm, nurturing spirit, and abiding love of libraries are evident to all who know her. She has guided the Friends of the Library through a Lynchburg Reads program, advocacy efforts that led to the establishment of an endowment fund, and successful fund-raising to support library programs. In 1977, with the assistance of the city planning department, Dodge drafted a master plan for the Lynchburg Public Library, which resulted in the doubling of the size of the central library. When the Lynchburg City Council appointed a blue-ribbon commission to suggest ways to memorialize Dr. Martin Luther King Jr., she was instrumental in establishing the Dr. Martin Luther King Jr. Center for Human Rights at the Lynchburg Public Library. The center opened to the public in 1991 after a 15-year struggle to find an appropriate way to honor Dr. King. Dodge has provided leadership in the development of a consortium of area public and academic libraries that increased access to collections for library users in the greater Lynchburg area. Throughout her career, Dodge has demonstrated an intellectual curiosity about evolving technology for libraries and a clear commitment to library users and their needs. Librarians across the state benefit from Dodge's regular sharing of the Virginia Municipal League's newsletter and her careful monitoring of legislative activity. The Library of Virginia is pleased to announce an exciting new literary award: The Mary Lynn Kotz Award for Writing about Art. This award is unique in many ways. It is a joint collaboration between two of America’s most prestigious institutions: the Library of Virginia and the Virginia Museum of Fine Arts. The award, which will be presented to its first recipient in October 2013, will encompass many forms of writing, including poetry, history, journalism, fiction, biography, and museum exhibition catalogs. The award is named in honor of Mary Lynn Kotz, an award-winning journalist and New York Times best-selling author, who, as an art patron, has herself created or sponsored important art writing and journalism awards. Among her enormous contributions to the fields of literature and art, she is the author of the definitive, groundbreaking biography on Robert Rauschenberg, and she was also the last journalist to interview the reclusive Georgia O’Keeffe at Abiquiu, New Mexico. As a result of such works, she has been a frequent and popular presenter at art venues ranging from the Phillips Collection museum in Washington, D.C., to the Venice Biennale. Each October, beginning in 2013, the award will be presented along with other notable awards at the Library of Virginia’s annual Literary Awards Celebration. More information about the Mary Lynn Kotz Award, including submission criteria, nomination forms, and other avenues of participation, can be found on the Virginia Literary Awards website (www.literaryva.com). The ReferenceUSA database includes entries for 14 million businesses and 89 million residents. While often used simply as a telephone directory, it’s actually much more than that. Not only is it a useful tool for locating an individual or business, but it can be particularly helpful to entrepreneurs, individuals who are relocating to a new area, and job seekers wanting to learn more about a prospective employer. For those wanting data on business competitors, ReferenceUSA provides information such as the year a business was established, number of employees, sales volume, locations, and financial data, as well as a corporate tree showing parent companies, subsidiaries and branches. Additionally, users can find all businesses of a similar type that are located within a specific geographic area and can generate lists of businesses or residences by doing map-based searches that include or exclude geographic areas based on regions drawn by the user. Individuals who are relocating can create lists of businesses, churches, health care services, etc., that are in or near a specific county, city, zip code, or neighborhood and then view the locations on a map. Radius searches can be done to determine how far away certain types of businesses or services are from specific addresses. The database can also be used to create lists of residences based on estimated home value or estimated household income. Job seekers can search for a company or a group of companies within a certain industry and then see a list of current job openings (as provided by Indeed.com). They can also find information on a company’s size, location(s), and financial information and view an extensive list of key personnel. Clearly, this database can be of great use for many different types of research. Your Library of Virginia library card is your key to exploring this wonderful resource. Stop by the Library to get a card and visit the Library’s Using the Collections page to begin your research! Lee Woodruff, whose book In An Instant told the story of her husband’s wounding and recovery from traumatic brain injuries while he was covering the war in Iraq, will read from Those We Love, her first work of fiction, at a Books on Broad gathering on December 6. Those We Love Most draws on Woodruff’s own experiences with family tragedy and healing to create unforgettable characters confronting choices, examining mistakes, fighting for relationships, and ultimately finding their way back to each other. Critics are praising Those We Love as an engrossing and poignant family drama. Woodruff is a correspondent for CBS This Morning and the co-founder, with her husband, ABC News anchor Bob Woodruff, of the Bob Woodruff Foundation, which assists wounded servicemen and their families with receiving the long-term care and helps them successfully reintegrate into their communities. The December Books on Broad will begin with light refreshments (wine and cheese) at 5:30 PM, followed by the author talk at 6:00 PM, with the book signing from 6:45 to 7:30 PM. Copies of Those We Love are available through the Virginia Shop. Okay for Now by Gary D. Schmidt and Balloons Over Broadway by Melissa Sweet are the winners of the 2012 Jefferson Cup. Okay for Now took the honors in the young adult category and Balloons Over Broadway was the juvenile winner. Newbery honoree Schmidt's book is a sensitive coming-of-age story filled with loss and recovery set during the late 1960s. Doug Swieteck's life takes a turn for the better when he makes friends with Lil, who helps him find the courage to endure his father's abuse and deal with the return of his older brother from the Vietnam War. 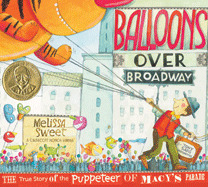 Melinda Sweet's award-winning Balloons Over Broadway is whimsical look at the puppeteer whose creations made the beloved Macy's Thanksgiving Day Parade possible. This beautifully illustrated picture book is an inside look at master puppeteer Tony Sarg and how the giant, magical, colorful Macy's parade balloons came to be.